Chehel Sotoun (Forty Columns) is a pavilion in the middle of a park at the far end of a long pool, in Isfahan, Iran, built by Shah Abbas II to be used for his entertainment and receptions. 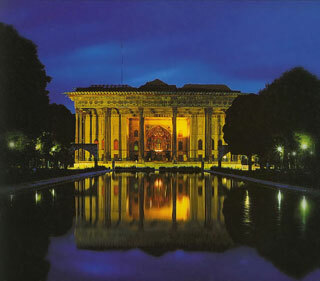 In this palace, Shah Abbas II and his successors would receive dignitaries and ambassadors, either on the terrace or in one of the stately reception halls. This article uses material from UNESCO World Heritage List article "Chehel Sotoun", which is released under the Creative Commons Attribution-Share-Alike 3.0 IGO License.